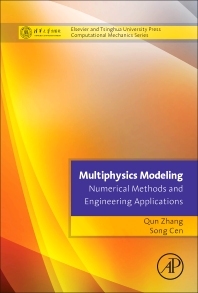 Multiphysics Modeling: Numerical Methods and Engineering Applications: Tsinghua University Press Computational Mechanics Series describes the basic principles and methods for multiphysics modeling, covering related areas of physics such as structure mechanics, fluid dynamics, heat transfer, electromagnetic field, and noise. The book provides the latest information on basic numerical methods, also considering coupled problems spanning fluid-solid interaction, thermal-stress coupling, fluid-solid-thermal coupling, electromagnetic solid thermal fluid coupling, and structure-noise coupling. Users will find a comprehensive book that covers background theory, algorithms, key technologies, and applications for each coupling method. Engineers and researchers facing multiphysics problems as part of the design, modeling and analysis of complex engineering systems. Dr. Qun Zhang has more than 15 years’ experience in multiphysics research, code development and engineering applications, including a PhD in the field of fluid-structure interaction. Formerly a senior development engineer at ANSYS Inc specializing in multiphysics products, he founded a company in 2009 to develop the multiphysics simulation software INTESIM. Professor Song Cen works in the Department of Engineering Mechanics in the School of Aerospace Engineering at Tsinghua University. He is also the Deputy Secretary-General of the Beijing Society of Mechanics and an Executive Council Member of the International Chinese Association for Computational Mechanics. He has authored multiple books and numerous highly-cited papers in the area, and has won prestigious prizes for his work, including the ICACM Young Investigator Award (awarded by International Chinese Association for Computational Mechanics, 2011).